So what is this punk thankful for this year? So Dan called me with a real predicament. Dan: I've got my jumpsuit on and I'm ready to play some Black Sabbath, what should we do?? 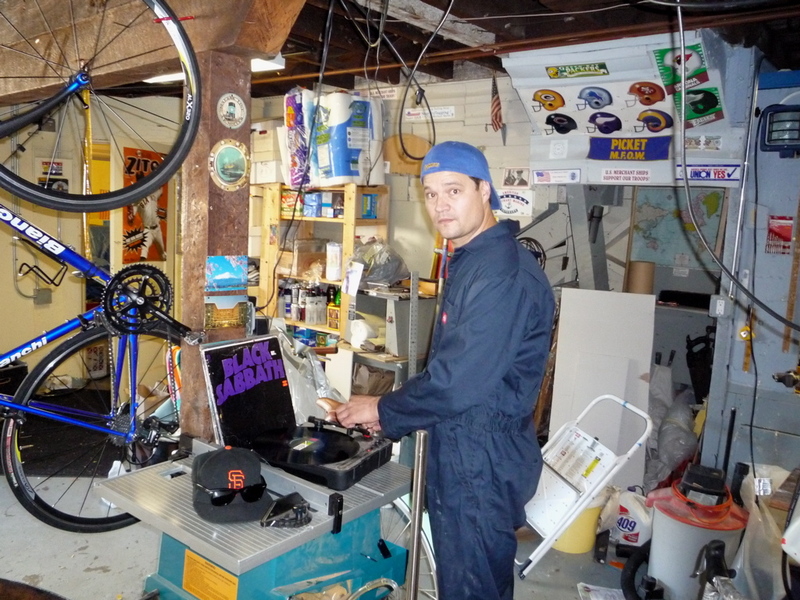 Me: Dude, we've totally got to rack the wine, it's an excellent excuse to wear a jumpsuit and blast Black Sabbath in the garage. Me: Totally... I'm on my way. So we had to rack the pinot off the gross lees today, that and check to see if we'd completely eradicated the h2s issue and we can move on with malo or not. Though we've still got a minor amount of the egg smell (something that is only really noticeable when doing the h2s bench test) we still had to do another minor copper sulfate treatment to make sure it is completely removed before it turns into something less manageable. 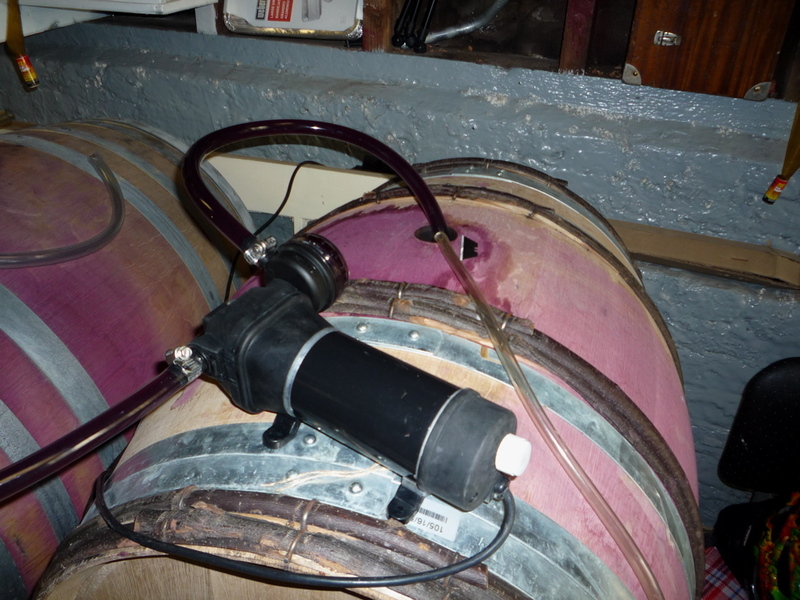 The racking went smoothly and our little italian pump did its job well. Next week there will be one more bench test to determine whether we are done with our little h2s problem. If all goes according to plan it should be completely gone and we'll be ready to start our secondary, malo-lactic, fermentation. 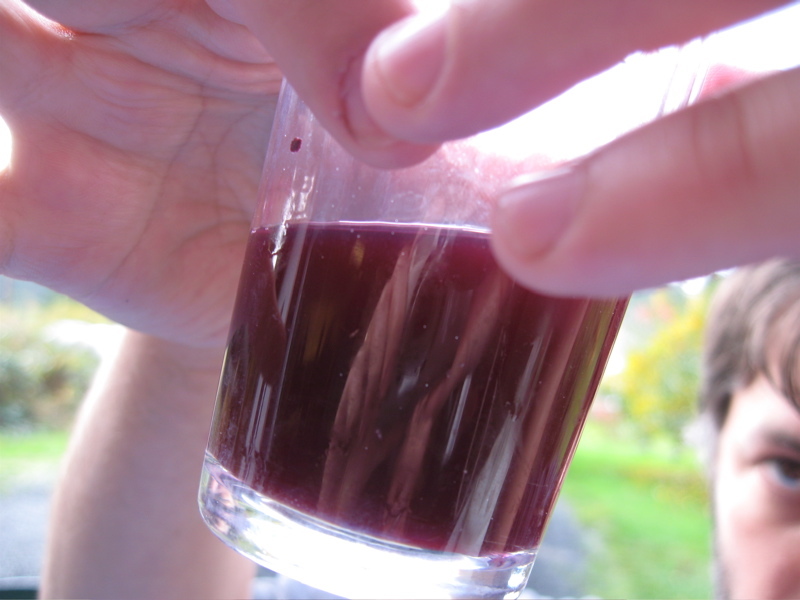 Beaujolais Nouveau n'est pas Arrive! so the heavy lifting is mostly done for '08 - shy the previously mentioned egginess - and we're starting to look at how to do more in '09. We've got a few difficult choices ahead of us as the natural next step is going "pro" and the whys, wheres, hows and whats that are involved in that process are enough to consume much of our off-season time and money. But in the meantime with just a few little bows to by tied on 2008's vintage. as you saw from Dan's post (including the unfortunate attempt at recorded funkiness on my part) we're just around the corner from starting malo-lactic on the humboldt pinot. As for the grapes from 693 miles north-northeast of the Fruitland Ridge the Malo-Lactic has kicked off slowly on it's own thanks to last year's bacterial infection. Where as the Pinot showed us in all of it's pinotie goodness that planning is something good to do in between fixing previously fucked up plans - what with its overly hot fermentation that forced us to press right after we'd rolled into town from the great northwest and the H2S and its subsequent treatment that will get us booted from the natural wine world. Up north we rolled out a schedule, a plan you could say (though one peered at through cracks in between fingers with fear), and got to work. What was amazing about the plan up north is it actually worked!! 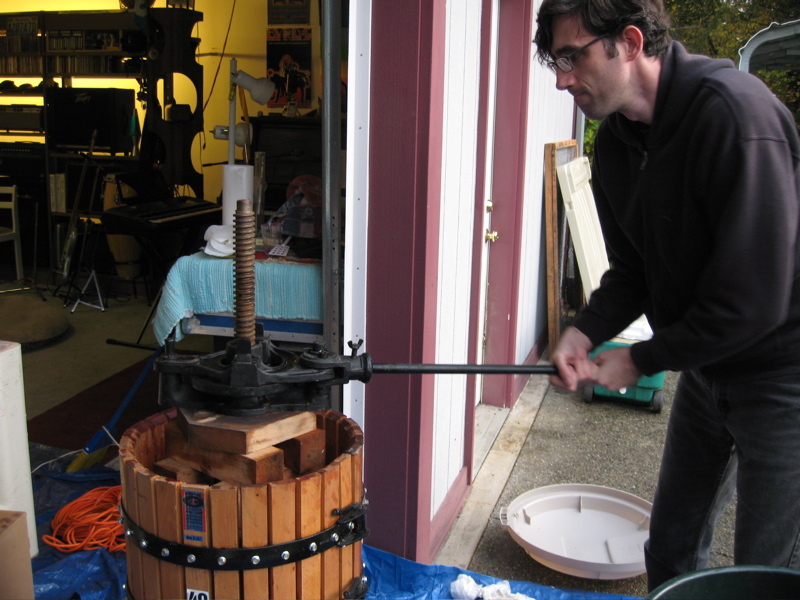 In the manner of a stuck clock we totally nailed it once and when I rolled up to press the syrah it was ready for me. We got a lot of help on both sides our efforts and there are many folks that deserve out thanks. The Lubliners for hosting our fermentation in their very well appointed garage, Sherman, Lubby and my dad for keeping an eye on the fermentation and reporting in on a regular basis and all of the sorters and co-pressees. I would like to give a special thanks to Adam for not only being there through the entire sort but also coming back to help (along with Jenne and Paul) run the press from start until clean up -- hats off. Now with roughly 275 gallons of wine sitting (including last year's still aging wahluke syrah) we start the planning for next year. do we go pro in CA? do we go pro in WA? do we go pro in both? do we truck grapes from Wa to CA? 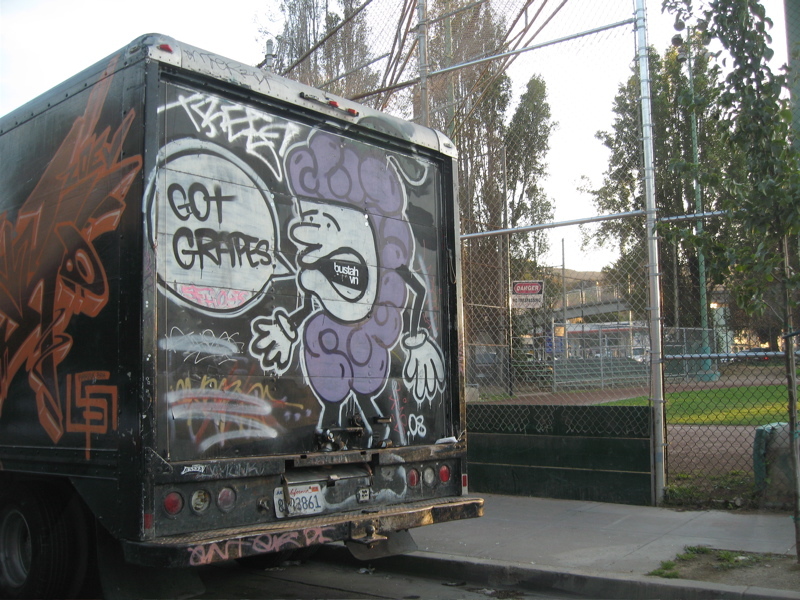 do we truck grapes from CA to WA? do we find our own space, find a winery looking for someone to share their space, go the custom crush route? we'll see but in the meantime I believe we have some rackin to do and malo to start this weekend and Dan is well... excited. 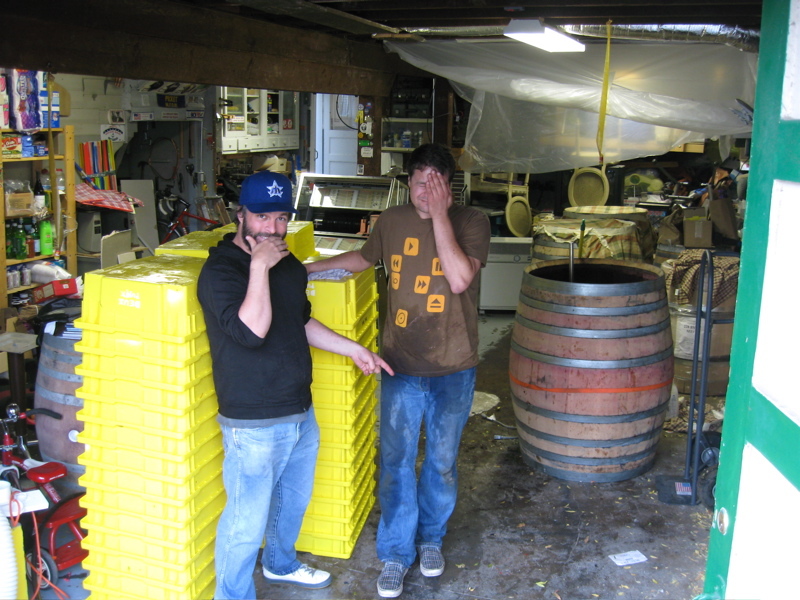 So our Pinot smells stinky; and not in that cool natural wine stinky smelling way. We have a bit of hydrogen sulfide (H2S) in our wine which smells like "morning breeze" or rotten eggs. Most likely created when the cap in the puncheons got too big and heated up. The 2-foot cap had a higher temp than the must and the yeast in the cap got over stressed. Apparently this happens with Pinot Noir and we now realized we should have gone with 3 puncheons or controlled the cap and temp more during fermentation. There is no "damage" per se. Just an odor. After some research and soul searching we decided to use a small amount of copper sulfate to convert the H2S into copper sulfide which will percipitate out. I took 3 semesters of chemistry in college and surpisingly I can following what is happening. After some bench testing we agreed that we'd use a 0.1 ppm addition. The plan is to do another test next week to see if we need anything more. 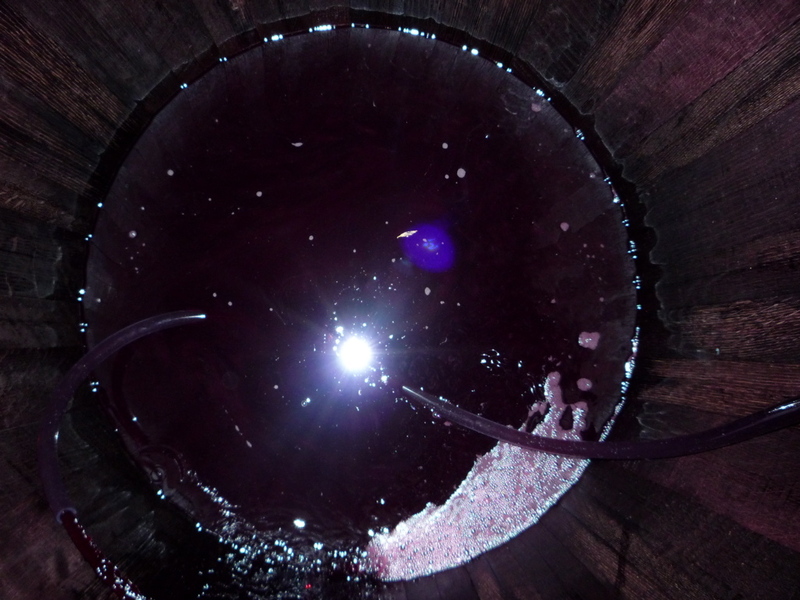 There should be no trace of copper in our final wine; however, it is a bit annoying dealing with this issue. 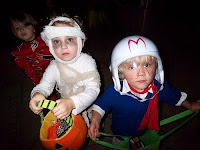 Being a stand-up family guy (see previous post) I look forward to Halloween every year. This year our family was all about Speed Racer because or 3-year old son is all about Speed Racer. 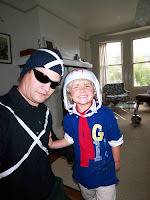 I got to be the uber cool Racer X, my wife Trixie and Calvin was Speed. Our neighborhood is ground zero for trick-or-treating in San Francisco, which makes our life easy. 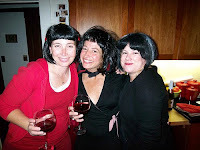 We started out at our friends house with killer ghoulish food and wine. I brought over a few fun bottles to balance out some of the not so good things others might be bringing. Surprisingly the selections were not too bad (lots of Cab Sauv and Zins). Once full and buzzed we hit the streets. Import to note that a Bugaboo stroller can hold a good amount of wine. But we did run out half way from home. What to do? I asked the first candy giver, "Do you have any booze for Racer X?" At which he replied, "sure, what kind?" Unfortunately I went with the red wine. I am now going to try to describe this red liquid: It smelled EXACTLY like Crystal Light Lemonaide. It drank so hot that my throat burned. It tasted of bad concentrated fruit and rotten logs. UNDRINKABLE and not worthy of the gutter we all poured it into. I didn't get to see the label, but I am guessing this was a South African Zin purchased at a corner market or Bev-Mo. Single worst glass of wine I have ever had! Luckily our friends live a few house away and saved us with 9 ice cold beers. I still want to know what that wine was. I do know that was a trick and not a treat. year or we'll egg your house!"